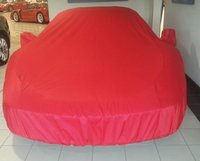 Custom made breathable indoor car cover for Ferrari F430 coupe or Spider, as the fabric leaves no fluff on hoods. Made for this model only with mirror pockets and elastricated ends for a good, close fit. The fabric is soft, like the skin of a peach so slightly furry on the inside, with a woven outer which is dustproof, and machine washable. Available in a choice of 5 colours - so the only custom made car covers for the F430 in a choice of colours anywhere near this price. Choose from: Rosso (Red), Nero (Black), Grigio (grey), Blu Tour de France (Navy Blue) and Dark Green. Hand made in typically 2 days.